Hot summer days are the days for simple meals, cook-outs with family and friends and using the oven as little as possible. Do I hear an amen?! In the summer I veer far away from most roasted meats, casseroles, stews and heavy meals and instead gravitate toward the lighter, more refreshing fair of main course salads, chilled meat dishes, fresh fruit, side salads, seasonal veggies and light fruit-based desserts. In fact, it was on a hot summer afternoon that I first played around with the idea of a simple roasted corn salad, of which this recipe is a new favorite variation. This Sweet Roasted Corn Salad is quick and easy to throw together. It’s also colorful and flavorful, and it only requires three minutes max under the broiler. 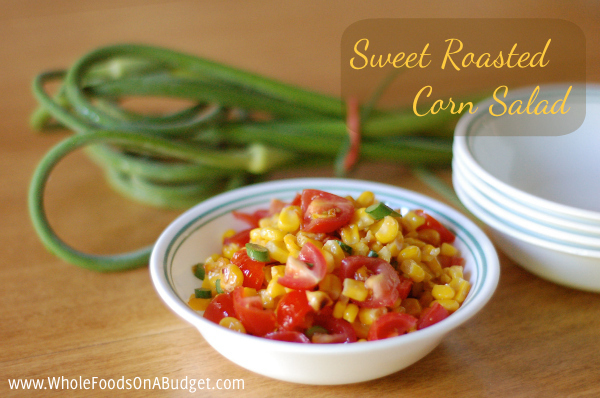 That quick broil sweetens the corn and adds a hint of smoky flavor to the salad—yum! No other stove or oven time is needed for this salad, making it a favorite hot-weather dish of mine… not to mention that fresh tomatoes and corn abound in the summertime! Sweet Roasted Corn Salad is the perfect addition to backyard cookouts and potlucks. It pairs just as nicely with your basic hot dogs and hamburgers as it does with the more fancy grilled chicken or sausages. Take it to your next gathering or serve it at your next backyard cookout. It’s easy to double or triple the recipe for a large crowd, and it’s budget-friendly. I’ve kept this recipe simple by using frozen corn, but if you want to up the ante, make this salad with fresh corn sliced off the cob. The recipe becomes a bit more time intensive; but if you have the time, the flavor of fresh picked corn just can’t be beat! If you choose to use fresh corn, bring a large pot of water to boil. Once the water is boiling, add 5 medium-sized (shucked) corn cobs, cover, and wait for the water to come back to a boil. Once it returns to a boil, the corn is done. Pull the corn out immediately and cool. Slice the corn off the cobs with a knife and carry on with the recipe below. Five medium-sized ears of corn should yield about 3-1/2 cups of corn kernels, which is about one pound, the amount used below. Preheat the broiler to 550°F (or high). Spread corn on a broiling pan and place in the oven on the highest oven rack. Broil for just 2-3 minutes, watching carefully. Pull out the corn when the kernels are just beginning to brown. Add the corn to a mixing bowl. Slice grape tomatoes into quarters and mince the chives (or scapes). Add the tomatoes and chives to the mixing bowl. Add the rest of the ingredients to the mixing bowl, except the cilantro, and toss well to combine. Sprinkle the salad with minced cilantro if desired. Serve immediately or chill in the refrigerator until ready to serve. * Consider purchasing organic corn (or non-GMO corn if you can find it) due to the extremely toxic pesticides used on GMO corn, which is most conventionally grown corn. Christy is a wife and mom of four who loves good food and loves to cook. Christy blogs at Whole Foods on a Budget, where she shares the beauty of real food, her favorite whole foods recipes, tips on buying wholesome food on a small budget, information on small-space gardens and grace-filled encouragement to make small, steady steps toward healthier eating. Christy and her sister Jessica recently released a new cookbook Whole Foods for the Everyday Cook. You can connect with Christy on Facebook, Twitter, Pinterest and Instagram.